One of the most pressing realizations of life in the hustle and bustle of the modern world is that society lacks a mechanism for self-reflection. Our culture seems to almost shun inner contemplation in favor of a constant barrage of outer instant gratifications. In this way, people are less focused on cultivating their best inward-looking selves than they are their exteriors; this is a camouflage that hides our path towards full actualization. In times like these, it is always best to turn towards thinkers who go beyond the routine, who look broadly at the world, and sense how we can improve the many challenges that we face on a daily basis. Rabbi David Jaffe, a leading Jewish teacher today, is a rare phenomenon. He is indeed a Jew at home and a Jew in the streets. On the one hand, he is rooted in Jewish texts, learning and devotional practices. On the other, much of his professional life is also oriented towards social change work. In his newest book Changing the World from the Inside Out (Trumpeter), he works to intertwine the two. Even before picking up the book, I was moved by my mentor Rabbi Dr. Yitz Greenberg's endorsement of it. He writes of Rabbi Jaffe's book that it "combines sweeping, idealistic visions to repair the planet with practical, realistic approaches that enable this to get done, one step at a time." My teacher Ruth Messinger, the former president of the American Jewish World Service and an extraordinary leader," writes that this book is "An incisive investigation of the key questions that confront anyone who hopes to make individual or systemic change." Alan Morinis, the great teacher behind the Mussar Institute, wrote "This wise book is essential reading for anyone who recognizes that the world's problems demand spiritual solutions, because it is we who must change before we can expect to change the world...He shows us how to tap the wellsprings of motivation, channel emotions, and align our behavior with our highest values to make us more effective in serving the public good." Indeed, Jaffe does not merely offer suggestions but excellent tools for growth in spiritual leadership. One of the most central themes of the book that readers should pick up on is that the pace of change and managing our inner world accordingly is of the utmost urgency. Indeed, as a teacher of mussar (Jewish character development), Jaffe strives for inner transformation, not only in his students, but for people all over the world. In his view, this process is deeply and fully rooted within the folds of Jewish practices and thought. 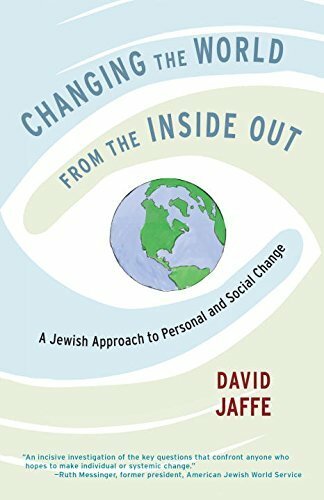 Jaffe writes that he wrote, "[t]his book [as] a Jewish approach to transforming our inner lives in the process of, and for the sake of, transforming the world." It shows. Lamentably, the larger metamorphosis from a society that craves meaningful spiritual provocations have mostly been forgotten; he is working to revive them. This is not a straightforward path. Stylistically, the book is broken down into four parts (ingeniously following a hiking metaphor): "the compass," "signpost, ""walking the path," and "rest." The symbolism here is heartfelt and clear: life is a path, most often never a straight one. But there is always a goal that we are aiming for, and that is completing our journey, wherever that may take us. Jaffe's book is organized and never strays from the singular topic at hand: transforming the world through transforming the self. But this is not solely about spiritual growth but also about being more effective change agents. The goal is not just to win, but to lead. But Jaffe is not an author merely offering suggestions. At many junctures in the book, he offers excellent tools to develop our middot (value systems) and make them tangible. Furthermore, we not only need to lead in a temporal sense, but also with an eternal perspective of kedushah (holiness) that is imbued in every deed. Changing the World from the Inside Out is a highly recommended read for those who are change-agents and those who aspire to be. This book is not meant for speed-reading. While the ideas are not complex per se, they are deep and require pause, meditation, reflection, and, most importantly, internalization. This is a globally oriented book. It was not written to convince assimilated Jews of the value of Judaism, nor was it written to convince engaged Jews of the value of social justice work. It transcends the elementary to address those who are already engaged and passionate Jewish leaders, while leaving room for those who want to learn more to have a guidepost in a single, comprehensive volume. One need not have any Jewish knowledge to read this book, but to appreciate the depth of the work, readers should merely be open to investing in their inner journey, the spiritual enterprise. It will be an investment that is sure to pay off. Rabbi Dr. Shmuly Yanklowitz is the President & Dean of the Valley Beit Midrash, the Founder & President of Uri L'Tzedek, the Founder and CEO of The Shamayim V'Aretz Institute and the author of ten books on Jewish ethics. Newsweek named Rav Shmuly one of the top 50 rabbis in America.